I love cushions. It’s a sleepy, disoriented girls best friend. As a rule, it is easier to apply and blend out. Besides, there’s something about the asian formula works way better for my skin. I have to admit, for this BEAUTY PEOPLE cushion sucked me in by the packaging. I would have bought it to just look pretty on my table. Luckily they had one geared towards combination oily skin (no further justification needed). To the basket you go. Over time I have noticed that asian oriented products, while not always being a perfect match (they tend to run very light, so summer tan can be a problem) works way better than western base products for oily skin. Later being more likely to be extra matte and since I have dry spots on my cheeks, they tend to get flaky in about 30 minutes if not immediately. Or out of sheer stubbornness, my skin unloads week times amount of oil in a few hours. That is why I prefer asian cushions – hydration for dry patches and oil control for the rest of my face. Checks both of my base goals. As I have mentioned beforehand I bought this one basically for the packaging. The fact that they had one for oily skin was a lucky coincidence. I just love the fancy look of it. 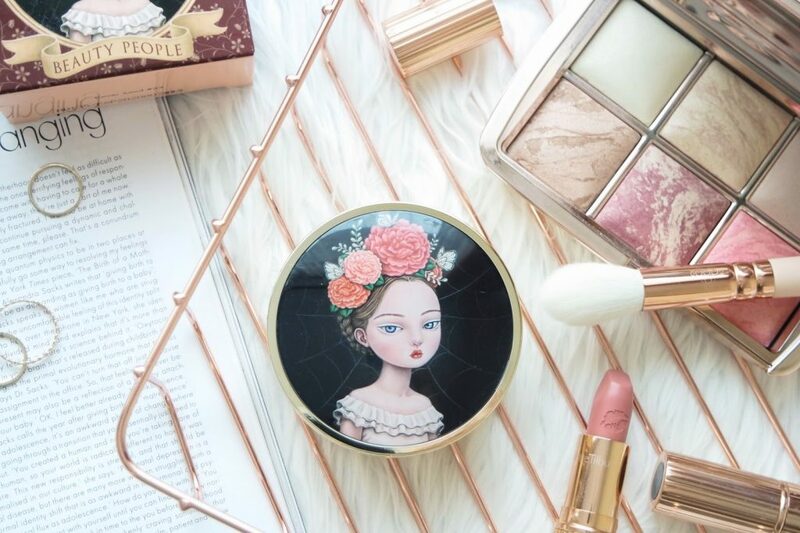 It is a rather thick compact, actually the biggest one I have ever owned so it might not make the best traveling companion, but it still takes way less space than usual foundation bottle and then a sponge or brush to apply it. The product itself is certainly worth attention. After 4 hours of wear it looked like I just applied it, just a little bit more glowy, after 7 hours some oil got through, mainly on my nose, but in other areas, I could successfully pull it off without blotting. On the 9 hours of wear time, it wore off slightly where I am oiliest – sides of my nose. Everywhere else it was still going strong. Nothing a quick touch up couldn’t fix. So if you happened to be lucky to be certain two shades of pale (as a true asian product, that is the whole shade selection) it is definitely worth your attention. Besides, it looks way too cute.